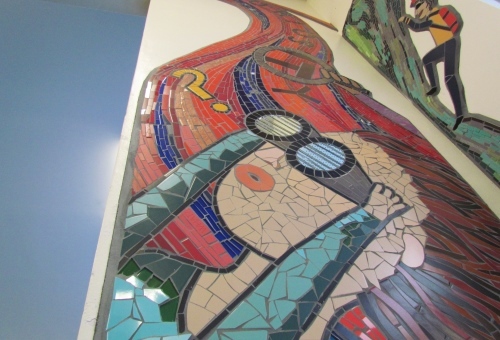 BAL have helped mosaic artist Tamara Froud transform a primary school dining hall with installations designed by pupils and taking inspiration from the school’s values. 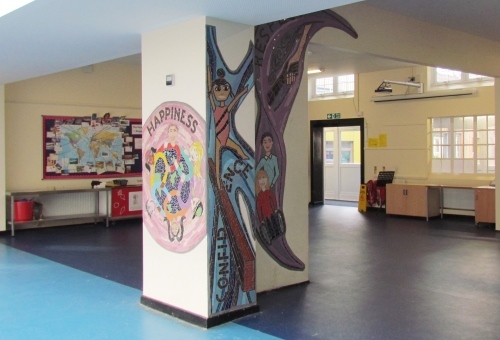 A fixing solution of BAL adhesive and grout provided Tamara with the perfect materials to permanently fix ornate Cinca ceramic mosaics to a 6-sided, T-shaped concrete pillar at Richard Alibon Primary School in Dagenham, Essex. 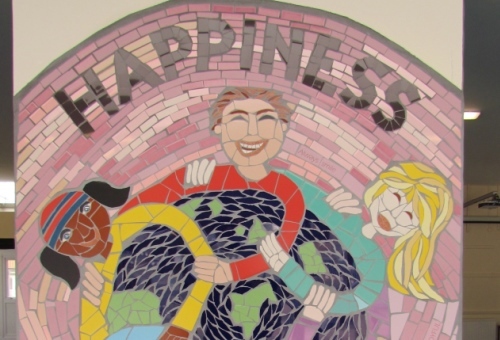 Tamara was commissioned by the school to work with pupils to create designs based on the school’s values of confidence, perseverance, ambition, curiosity, respect and happiness. She visited the school to lead a design day before creating the final design – based extensively on the children’s drawings – at her studio in Catford, South London. Tamara then returned to the school for two weeks of learning workshops where she worked with the students and taught them the basics of mosaic tiling so they could be involved in the fabrication of the mosaic. She completed the project during the school holidays. During the installation, Tamara used BAL Max Flex Fibre tile adhesive to fix the mosaic tiles onto a mesh background. Max Flex Fibre is highly flexible and is enhanced with Fibre Strand Technology meaning it withstands movement, plus its extended open time allows for larger areas to be fixed in one mix – perfect for large mosaic installations. The project was completed with BAL Micromax2 grout which provides a smooth and clean finish with protection against efflorescence to minimise the risk of discolouration. Highly flexible, BAL Micromax2 also has enhanced durability making it suitable tiling projects on most backgrounds. Tamara used the BAL products after attending at Mosaic Tiling training course at BAL’s Innovation and Technology Centre (ITC) in Stoke-on-Trent organised by the British Association for Modern Mosaic (BAMM). “As a member of the BAMM committee I’ve always wanted to push training to help standardise best practice amongst our members, so teaming up with BAL for specialist training has been a real boost,” said Tamara.